Maunakea, Hawaii – Astronomers have found a new exoplanet that could alter the standing theory of planet formation. With a mass that’s between that of Neptune and Saturn, and its location beyond the “snow line” of its host star, an alien world of this scale was supposed to be rare. Aparna Bhattacharya, a postdoctoral researcher from the University of Maryland and NASA’s Goddard Space Flight Center (GSFC), led the team that made the discovery, which was announced today during a press conference at the 233rd Meeting of the American Astronomical Society in Seattle. Using the Near-Infrared Camera, second generation (NIRC2) instrument on the 10-meter Keck II telescope of the W. M. Keck Observatory on Maunakea, Hawaii and the Wide Field Camera 3 (WFC3) instrument on the Hubble Space Telescope, the researchers took simultaneous high-resolution images of the exoplanet, named OGLE-2012-BLG-0950Lb, allowing them to determine its mass. In an uncanny timing of events, another team of astronomers (which included Bhattacharya and Bennett) published a statistical analysis at almost the same time showing that such sub-Saturn mass planets are not rare after all. The teams’ results on OGLE-2012-BLG-0950Lb are published in the December issue of The Astronomical Journal and the statistical study was published in the December 20th issue of the Astrophysical Journal Letters. OGLE-2012-BLG-0950Lb was among the sub-Saturn planets in the statistical study; all were detected through microlensing, the only method currently sensitive enough to detect planets with less than Saturn’s mass in Jupiter-like orbits. 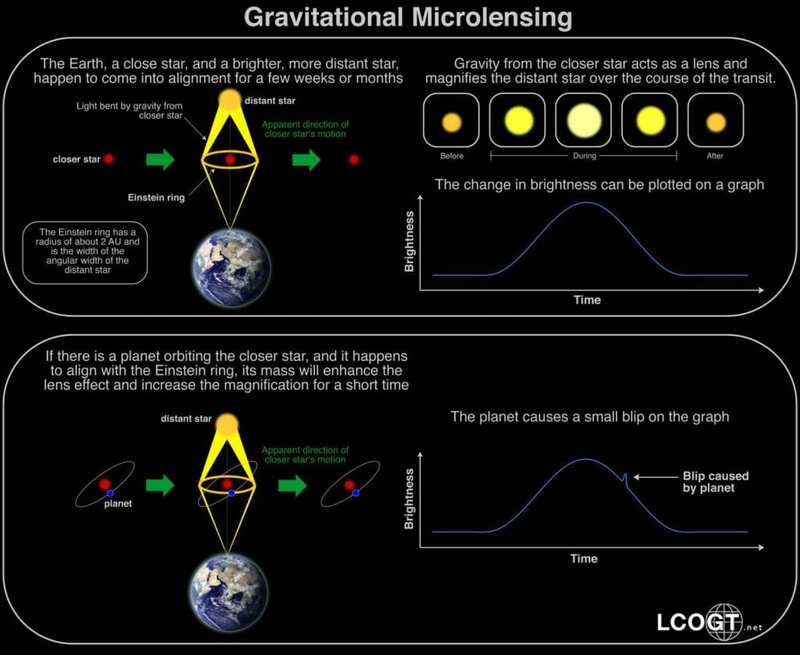 Microlensing leverages a consequence of Einstein’s theory of general relativity: the bending and magnification of light near a massive object like a star, producing a natural lens on the sky. In the case of OGLE-2012-BLG-0950Lb, the light from a distant background star was magnified by OGLE-2012-BLG-0950L (the exoplanet’s host star) over the course of two months as it passed close to perfect alignment in the sky with the background star. By carefully analyzing the light during the alignment, an unexpected dimming with a duration of about a day was observed, revealing the presence of OGLE-2012-BLG-0950Lb via its own influence on the lensing. OGLE-2012-BLG-0950Lb was first detected by the microlensing survey telescopes of the Optical Gravitational Lensing Experiment (OGLE) and the Microlensing Observations in Astrophysics (MOA) collaborations. Bhattacharya’s team then conducted follow-up observations using Keck Observatory’s powerful adaptive optics system in combination with NIRC2. For the statistical study, Suzuki’s team and MOA analyzed the properties of 30 sub-Saturn planets found by microlensing and compared them to predictions from the core accretion theory. What is unique about the microlensing method is its sensitivity to sub-Saturn planets like OGLE-2012-BLG-0950Lb that orbit beyond the “snow line” of their host stars. The snow line, or frost line, is the distance in a young solar system, (a.k.a. a protoplanetary disk) at which it is cold enough for water to condense into ice. At and beyond the snow line there is a dramatic increase in the amount of solid material needed for planet formation. According to the core accretion theory, the solids are thought to build up into planetary cores first through chemical and then gravitational processes. The runaway gas accretion scenario of the core accretion theory predicts that planets like OGLE-2012- BLG-0950Lb are expected to be rare. At 39 times the mass of the Earth, planets this size are thought to be continuing through a stage of rapid growth, ending in a much more massive planet. This new result suggests that the runaway growth scenario may need revision. Suzuki’s team compared the distribution of planet-star mass ratios found by microlensing to distributions predicted by the core accretion theory. They found that the core accretion theory’s runaway gas accretion process predicts about 10 times fewer intermediate mass giant planets like OGLE-2012- BLG-0950Lb than are seen in the microlensing results. This discrepancy implies that gas giant formation may involve processes that have been overlooked by existing core accretion models, or that the planet forming environment varies considerably as a function of host star mass. This discovery has not only called into question an established theory, it was made using a new technique that will be a key part of NASA’s next big planet finding mission, the Wide Field Infra-Red Survey Telescope (WFIRST), which is scheduled to launch into orbit in the mid-2020s. “This is exactly the method that WFIRST will use to measure the masses of the planets that it discovers with its exoplanet microlensing survey. Until WFIRST comes online, we need to develop this method with observations from our Keck Key Strategic Mission Support (KSMS) program as well as observations from Hubble,” said Bennett. The NASA Keck KSMS program will continue to make follow-up observations of microlensing events detected by telescopes on the ground and in space.